Maybe a firebox will be needed at Apple Stores so people can turn in the self immolating fake iPhones. Good idea. Then Apple could employ a robot, which safely disassembles problematic Samsung phones. I’m starting to wonder it these phones are not contaminated with some type of hack that makes them overheat. If so, couldn’t happen to a more evil company. A friend just told me his S& Edge is pretty warm after use and charge. His is though the At&T Next plan, and it two months in/ I did not have the answer so I am asking here. Does AT&T exchange those “phones” for an iPhone? Also his wife has the S7 Active. They would like to come over to real phones, and not burn up their pockets…money wise, nor burn down their house charging their “phones.” Thanks guys. BTW, almost got him talked into going all in on Apple. you’re not supposed to leave your phone over night to charge if you do you’re supposed to turn off the fast charging technology and use it in normal charging mode. if you go to settings it says, “device might hot while using the fast charging technology”. when you active fast charging the device charges at a faster Rate than normal and lithium batteries are pretty sensitive and anything can triggered them if you’re overcharged the battery overnight. 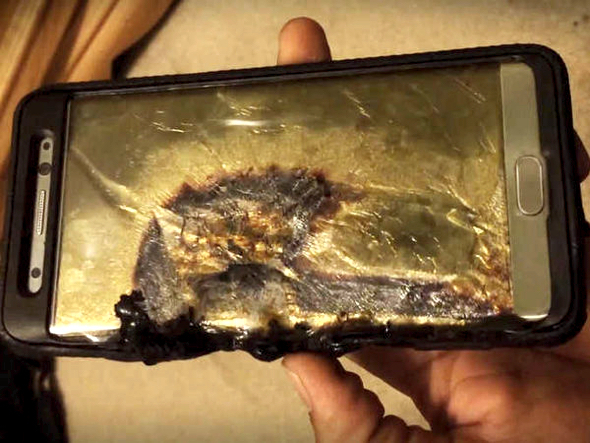 also third party chargers and unauthentic charges have caused samsung and iphones to catch on fire in the past. cheap chargers aren’t up to industry safety standards and they can make your phone catch on fire. ipods were the first device to catch on fire in people’s pockets or hands. then in 2009 iphone fire reports started showing up on the Internet. iphones have killed, electrocuted, catch on fire in people’s pocket, severely burn the customer and caused property damages. iphone have blown up car and have caught on fire in mid flight. iphone are infamous for overheating. last time I check iphone they tell you to wait a while for the phone to cool down. From what I read, it was the third party chargers that caught fire, not the iPhone. cheap chargers can cause a galaxy or iphone to catch on fire like the ones sold on amazon, but the ones reported weren’t all third party chargers. some people iphones caught on fire weeks after using the device or even when they were using the charger that it came with then it caught on fire for reason. Meh. Apple has one-off melting/overheating/burning batteries as well. Let’s see if this becomes another statistics busting catastrophic trend before we kick ’em again while they’re down.